33 Years Ago Today - Joe.My.God. 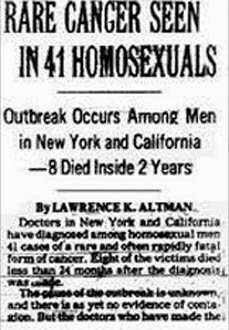 Doctors in New York and California have diagnosed among homosexual men 41 cases of a rare and often rapidly fatal form of cancer. Eight of the victims died less than 24 months after the diagnosis was made. The cause of the outbreak is unknown, and there is as yet no evidence of contagion. But the doctors who have made the diagnoses, mostly in New York City and the San Francisco Bay area, are alerting other physicians who treat large numbers of homosexual men to the problem in an effort to help identify more cases and to reduce the delay in offering chemotherapy treatment. The sudden appearance of the cancer, called Kaposi’s Sarcoma, has prompted a medical investigation that experts say could have as much scientific as public health importance because of what it may teach about determining the causes of more common types of cancer. New York City was the epicenter of the first stages of the AIDS epidemic, and Greenwich Village was in many ways the epicenter of the epicenter. For many years, Community Board #2, which includes Greenwich Village, led the city in terms of the number of AIDS cases and AIDS deaths. And many of the locations most strongly associated with the early fight against AIDS were located in the Village, including St. Vincent’s Hospital, where so many of the first cases of AIDS in New York were treated, and the LGBT Community Center (formerly the Gay Community Center) at 208 West 13th Street, where many of the earliest meetings organized in response to the AIDS epidemic were held, including meetings of the AIDS Coalition to Unleash Power (ACT-UP). Another key historic site in the Village in connection to the AIDS epidemic was the house at 186 Spring Street where Dr. Bruce Voeller lived. Voeller, who specialized in sexual health and research, got the name of the disease changed from the original inaccurate and stigmatizing Gay Related Immune Defense Disorder to Acquired Immune Deficiency Syndrome, and conducted the first studies showing that condom usage could prevent the spread of HIV. The original New York Times article and the reaction to it served as a major plot point in a number of plays and films, perhaps most notably in The Normal Heart and Longtime Companion.